Pick a goal, run it, crush it. Whether you're a running newbie or a looking for a new badge, start off 2019 by setting and achieving a goal. Eligible athletes who run 40 km or 80 km between Jan 2 and 15 will receive some post-challenge benefits. Go all out and run 80 km to get a new badge for your trophy case. #4080challenge. Complete 40 km or 80 km to receive a special post-challenge benefit. Go all out and run 80 km to get a new badge for your trophy case. 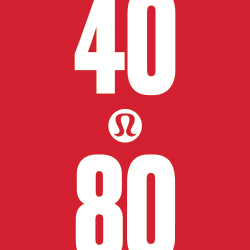 The content in this challenge is the sole expression of lululemon. Strava athletes who run 40 kilometers during the challenge period will receive a digital badge in their Strava feed. Participants who run 80 total kilometers will receive a second badge for their trophy case. To learn more about how to use Strava, please visit the Strava Support Center or email support@strava.zendesk.com. All other inquiries should be directed to lululemon. United States, Canada, the United Kingdom, Ireland, Germany, Switzerland, the Netherlands, France, Sweden, Puerto Rico, Australia, New Zealand, the United Arab Emirates, and Qatar. Eligible athletes will receive an email from Strava after the conclusion of the challenge.